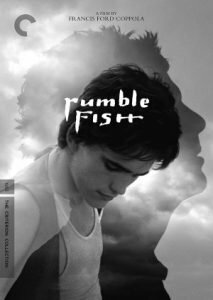 Francis Ford Coppola described Rumble Fish (1983), his screen adaptation of S.E. Hinton’s young adult novel, as “an art film for teenagers.” He shot it right after making The Outsiders (1982), also adapted from a Hinton novel, but where that was a lush, operatic tale, Coppola made Rumble Fish in stylized black and white, like a teen noir seen through the eyes of a kid who has mythologized the idea of street gang chivalry to the point that he can’t see the reality through the idealization. Matt Dillon is teenage tough guy Rusty James, a good looking, recklessly charming high school kid in the shadow of his brother The Motorcycle Boy (Mickey Rourke), trying to live up to a reputation that his brother wants only to live down. He’s an aspiring juvenile delinquent with a boozer dad (Dennis Hopper) and a nice girlfriend, Patty (Diane Lane), who attends Catholic School across town. Rusty James (always the two names, like a brand) is, of course, from the wrong side of the tracks in the industrial grit of a Tulsa that time left behind and this culture of bars and boozer and packs of kids who imagine themselves as real gangs is steeped in its own mythology, or rather Rusty is steeped in the mythology that no one else seems to revere. Kid Blue, completed more than a year ago, enjoyed a belated and unsuccessful release and arrived in the Jet City even later. 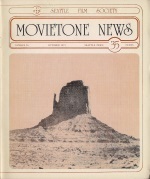 Reportedly Twentieth Century Fox advertised the picture as a straight western somewhere in the country and failed to find an audience for it (whatever audience they did reach with such a pitch would surely have been grievously disappointed). The film and the rest of the nation will have a second chance to get together after a New York Film Festival showcasing offers a proper reintroduction. Meanwhile, the Harvard Exit has scored another audience coup—not so spectacular as with such earlier previously-ignored-elsewhere pix as The Conformist, Taking Off, and The Emigrants, but not bad at all. Unfortunately the sizable weeknight audience I saw the film with tended to turn on at just those places where the filmmakers lost either perspective or their artistic souls. The American Friend (Criterion, Blu-ray, DVD) – “What’s wrong with a cowboy in Hamburg?” Dennis Hopper’s Tom Ripley is nothing like the character that Patricia Highsmith created and explored in five novels, and while Wim Wenders’s adaptation of Ripley’s Game, the sequel to The Talented Mr. Ripley, remains more or less faithful to the plot (with additional elements appropriated from Ripley Underground), the personality and sensibility belong to Wenders. The cool, cunning sociopath of Highsmith’s novel becomes a restless international hustler, selling art forgeries and brokering deals (some of which may actually be legal) while travelling back and forth through Germany, France, and the United States. His target, renamed Jonathan Zimmerman here (a Dylan reference? Wenders loves his American music, you know) and played with an easy (if at times arrogant) integrity by Bruno Ganz, is a German art restorer who now runs a frame shop due to the effects of a fatal blood disease. In true Highsmith fashion, the motivation is purely psychological and emotional—a small but purposeful social slight—and the reverberations are immense. Ripley concocts a medical con to convince Zimmerman he’s dying so a French associate (played by Gerard Blain) can tempt him to be his assassin, and then comes to his rescue as the French criminal extends the cruel little act of revenge to pull Zimmerman into additional murders. Roger Corman is the world champion of cinematic recycling. Why waste the potential of a set on a single film when there’s a hungry young aspiring director ready to cobble together a second feature and shoot on the set in the days (and nights) before it’s torn down? A couple of good films (and a whole lot of B-movie fodder features) were created because Corman played every angle of an asset, whether if be a particularly lavish set, a couple of days left on an actor’s contract or an expensive stunt sequence that surely could be reused in another feature or three. One of his favorite tricks was to buy up the rights to science fiction films from behind the Iron Curtain and have movies built around the special effects and/or action sequences. Two of these productions recently came out on the MGM Limited Edition Collection, one of the more robust MOD (manufacture on demand) lines currently pouring out its catalogue. 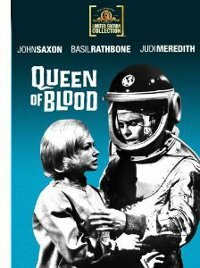 Queen of Blood (1966), directed by Curtis Harrington, is arguably the best of the Corman-produced recycling jobs and as fun a haunted spaceship film as there was until Mario Bava’s Planet of the Vampires. The special effects and alien ship came from a pair of big budget Soviet productions that Corman bought simply to cannibalize, notably Nebo zozyot (which a young Francis Ford Coppola previously turned into Battle Beyond the Sun, 1962, for Corman), and the plot reworks It! The Terror From Beyond Space (which provided the premise for Alien as well), with a green-skinned blood-sucking siren (Florence Marley) subbing for the marauding lizard of It! John Saxon, in All-American hero mode, is the leader of the three-person space mission that finds the ship floating in space and Judi Meredith and Dennis Hopper fill out the crew. Harrington, who came to genre filmmaking via avant-garde films (including collaborations with Kenneth Anger) and the wonderfully spooky Night Tide, a mix of horror, fantasy, character study and mood piece, creates his own film out of these elements, which he shot in a brisk ten days. The delicious imagery of the Soviet films, from the eerie planetscapes to the dreamy shots of ships in space to the delirious color-drenched interiors of the derelict alien ship, give the film a sense of scale and detail that Corman couldn’t hope to provide. The American side of the production tends to skimp on the American spaceship and space station sets. Basil Rathbone delivers his role seated at a minimalist control center that makes the Star Trek TV bridge look absolutely epic, ordering the astronauts via microphone (no view screens in this budget) to keep this specimen alive at all costs. Could you tell me what Kings of the Road is about and how you came to make it? It’s a film about two men and they’re making a journey across, along the border of East Germany from the North to the South, which is about a thousand miles, in an old truck, and they are repairing the projection equipment in the small villages. How did you choose the subject? Well, that’s not an easy answer. There are different subjects in the film. It’s not only the journey of the two men, but it’s also the situation of cinema, small cinemas in Germany that are dying out. It’s a little bit about the end of cinema altogether. It’s about the situation of men who are 30 now, born after the war like me. It’s about Germany nowadays. It’s about a lot of things. It’s about music and it’s about rock’n’roll just as well as about cinema. There’s quite a lot of rock’n’roll on the soundtrack. How did you pick what you used? I picked some favorite things. There’s a profound feeling of alienation in the film, emphasized by Bruno’s scream at the end. Are you trying to make any larger statement about men as a group being alienated, or do you limit this sense of alienation to these two men? . It’s more or less Tarzan’s scream. Well, it’s not only the alienation of these two because in the film … As soon as you pick somebody as the hero of a film, it turns out to be statement, not only about him but about mankind. So it is, rather, a film about men than about these two men. In a way, it’s a film about men totally in an American tradition—the road movie tradition—but on the other hand, it’s just the opposite of all these films because it’s not dealing with men the way all these films used to deal. It’s not reassuring them. On the contrary.